Search Engine Optimization (SEO) is the process of developing a website, or other online entity, to show up in the Search Engine Results Page (SERP). According to comScore (Feb. 2016), The 5 most popular search engines by rank are Google, Microsoft, Yahoo, Ask, and Aol. According to the analysis, Google handles 64% of the desktop home and work locations search share. Microsoft sites, on the other hand, handle approximately 24.1%. For this discussion, SEO is broken into two different groups. What is happening on your website (on-page SEO), and what is happening outside of your website (off-page SEO). Each search engine handles optimizations differently, so it’s important to have an understanding of each search engines practices to rank well. What is On-Page Search Engine Optimization (SEO)? 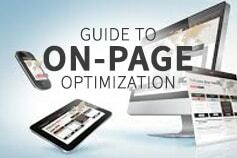 On-page Search Engine Optimization (SEO) is the structure, layout, content, and speed of your website. Additionally. if you develop a solid off-page SEO strategy, and provide a horrible website experience for your users, or the content isn’t relevant to content in the links, then your guests will leave (bounce). Off-page Search Engine Optimization (SEO) is other websites mentioning your company name or URL and other websites that direct people to your website through links. Just like a celebrity endorsement or and endorsement from a industry expert, the higher ranking or authority the website has that is talking about you, the better the link or mention will do for you. Off-page SEO can include blogs, other websites, emails and social media.